It is not a feel-good-movie but a feel-GREAT-movie! This is how I perceive Real Steel the robot boxing movie extravaganza starring Hugh Jackman. I highly recommend this movie to be seen and enjoyed by all fathers for it will make them feel like a young kid again playing with their most favorite toy. For all those young single adults, you can actually tag along your old man to catch this movie since it can actually represent the ultimate realization of your old man’s dream who at one time in their life was a young kid with rich imagination fancying about robots and action figures. What I like most about this movie is that it is a toned-down type of Transformers movie. It’s not a dark robot movie but instead light, fun and visceral. In Transformers there are scenes where I can hardly discern the robots apart when they fight, unlike in this movie in which the robots even during the action-packed fights can easily be discernable. Moreover, what I like most about the robots is that they are mere robots controlled by human pilots. They don’t talk, not percipient and do not have free flowing emotions. They are essentially like giant toys in which kids can grow deep attachments with. 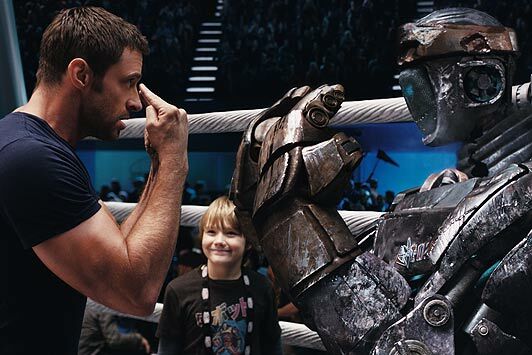 All in all Real Steel is a real deal of pure enjoyable rugged story with endearing characters along with action-packed bouts of brawling robots. Watchitwatchitwachit! If my father is only alive, I would definitely treat him to watch this fun and heartfelt movie. This could have been a great birthday present for Tatay Joe (my father) whose birthday is today. Grabe ang walang humpay na bakbakan ng mga bakal.